The interplay between light and shade that is offered by both the crack and alchemy of healing the bowl with a precious metal brings together all the elements. The Christian story of Good Friday has all these elements too although the promise of healing and wholeness is not fully realised on this day but with the dawn of Easter Sunday. The broken body, betrayal and humiliation that comes with the day by the founder of the firm (as Fr Bob Maguire refers to Jesus) is played out time and time again in history by the prophets. Those who stand up for those with the least often go the same way as Jesus and indeed it is the mark of many a successful prophet, even those who do not espouse to follow Jesus of Nazareth. 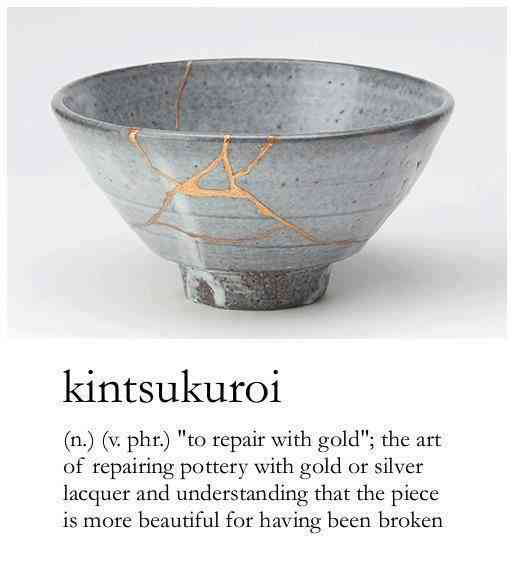 The idea of being broken is one thing, and then patching up the broken-ness with a golden (or silver thread) opens me up to deeper meaning of renewal and restoration. The light that gets reflected through the crack and then when it has been closed by metal that has been subject to heat and a crucible seems to me to be an incredibly relevant metaphor for Good Friday. The word crucible comes from the Latin word for cross (crux / cruc). I love this idea that the cross itself is the vessel holding the molten precious metal corresponds for me to the blood of Christ flowing in the Passion and through the process humanity is made new again – the cracks repaired and we are all more beautiful because of the repairs that are applied by the Divine in the rays of Easter morn. Inspired – the cosmic breath is received. Forming magma to apply to the cracks.